Browse our wide range of quality aviaries and aviary panels. Included in our range are our standard aviary designs as well as our made to measure aviary service. Our outdoor bird aviaries are suitable for a variety of different breeds of birds including budgies, canaries, finches, cockatiels, parrots, eagles, hawks, owls, birds of prey as well as poultry such as quails, chickens, guinea fowl, ducks and geese. Our avairies are manufactured to very high standards from quality treated timber and galvanised wire mesh. They are complete with nest boxes and roosting areas as well as a flight area for the birds. Perches and aviary safety porches can be ordered if required. In our extensive choice of quality aviaries you will find aviaries suitable to use outside in your garden or on your patio and we also make aviaries for use in animal sancuaries and care homes which are suitable for all sorts of different birds and poultry including budgies, parakeets, canaries, cockatiels, lovebirds, finches, birds of prey, parrots, owls, hawks, eagles, chickens, quails and ducks. They are manufactured to very high standards from treated timber and with a choice of galvanised wire mesh suited to the type of bird you are keeping. We are aviary specialists with knowlege of bird breeds including budgies, cockatiels, diamond doves, pigeons, rock pebblars, celestial parrotlets, rosellas, conures, lovebirds, grass parakeets, lineolated parakeets and even zebra finches. We offer professional and friendly advice on caged birds. We have the best selection of outdoor cages in our online shop including our best selling Victorian Hexagonal bird aviaries, all weather breeders avairies and our apex avairy with flight area and housing. Our standard and display aviaries offer the perfect solution for hobby bird keepers and bird fanciers alike. 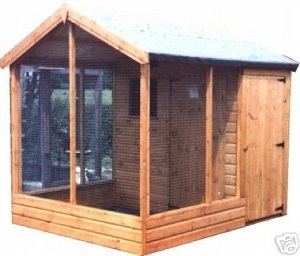 Our aviaries are also suitable to use as outdoor pet cages for cats, rabbits, dogs, chipmunks etc. BESPOKE SERVICE – Tailor-made to measure to your requirements. If you are looking for a specific size, shape or configuration. Our aviary panels are also available to make up your own chicken run, duck run or aviary to your own dimensions and specifications, so if you have any specific requirements or are looking for a bespoke design, please contact us. We’re always happy to hear from you to discuss your purchase.